9 | The geometric pattern of the lattice stepping stone design just beyond the glass continues here in the natural stone tile. 25 | Even the exquisite bath keeps with the lines, but once again we see the curves used in the commode and vessel sinks. 19 | The stone wall continues upstairs beyond the landing in the bar area to the right that provides functional storage space. 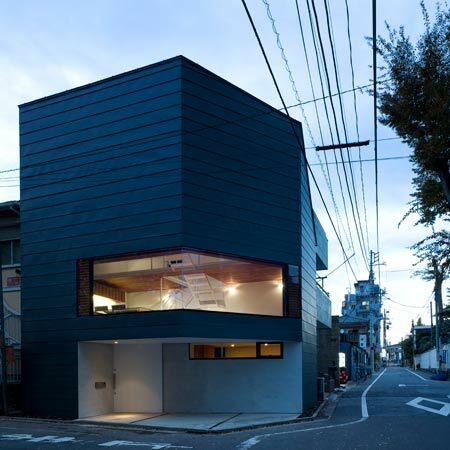 This design takes what lies beyond the walls of the home and extends it into every part of the living space. Created by FM.X Interior Design, natural materials and muted tones are used throughout. Just outside the hustle and bustle of downtown, this “returning hut” in Fujian, China takes the homeowner away from it all and into a world of serenity. 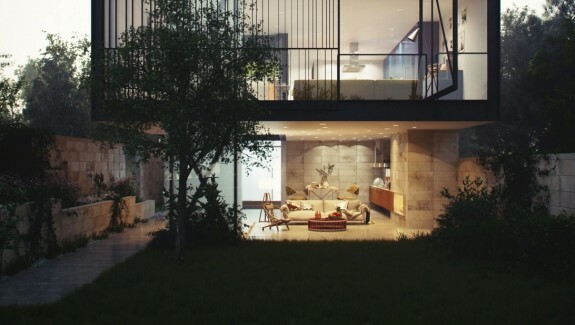 From the tree-filled courtyard and square lattice pavers to the stone walled living room that overlooks it, the space creates an air of stillness as if the surrounding property has created a fortress and become a buffer between you and the world outside. To the natural stone rock incorporated into the design of the house this house was made for solitude, with a beautiful presentation. 22 | The bedroom is visible from the tub which incorporates the stone existing on the property. The seclusion of the home allows the fabulous view of the outdoors. 5 | The designer uses various wood finishes to add interest. Here with the tables are one of the few use of curves in the home. The dining table gives an example of bringing the outdoors inside as it looks as if it was carved and simply placed on legs. 1 | Designer: FM. X Interior DesignPhotographer: WU Yong ChangThe simple wood stepped staircase overlooks the stone-walled dining and living areas just below and stays clear of the space, as if not to disrupt the tranquility of the sun-filled room. 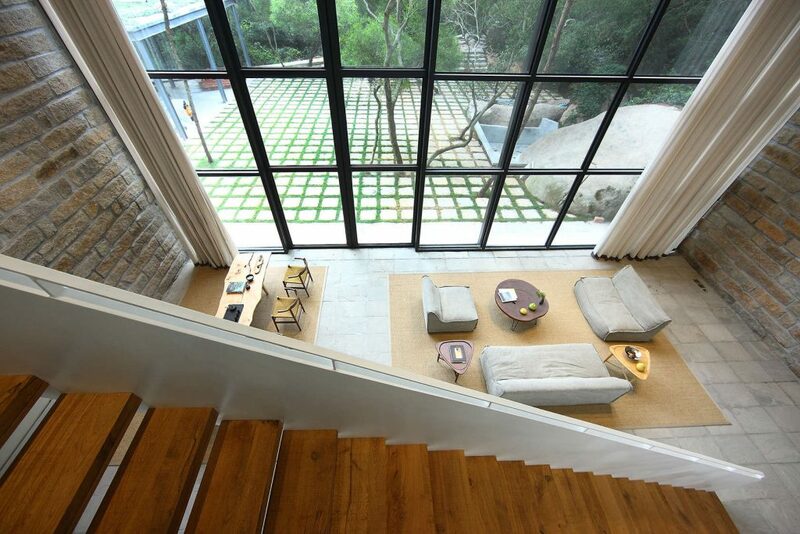 3 | The two-story stone wall continues the theme of this design and works well against the natural materials. 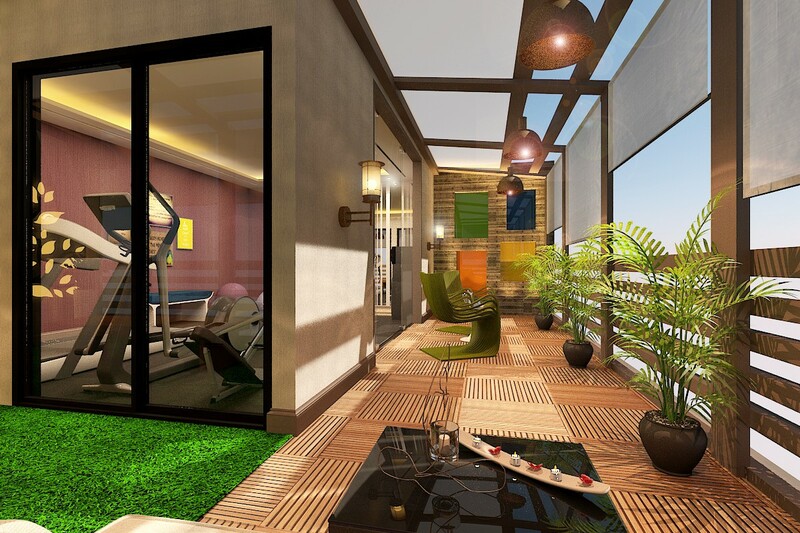 The two areas are well-defined by the rugs, one laying wall to wall and the other laying wall to window. 21 | Vessel sinks and stone counters sit atop the wood cabinets used for storage. 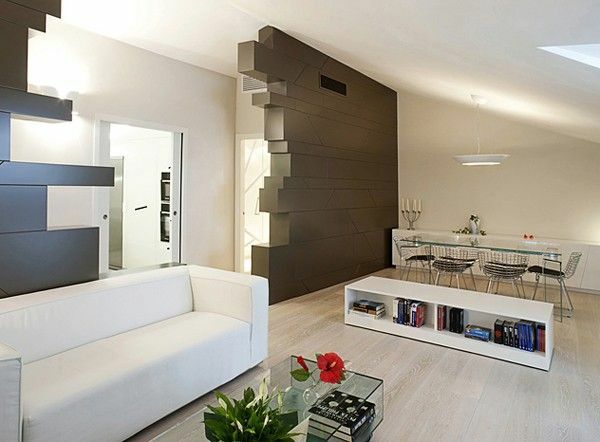 16 | The diagonal white wall encloses the stairs and provides a continuum of white against the mixed tone woods. 26 | The simple wall not only separates the master from second bedroom but serves as a closet. A Tranquil Getaway Home In China article this is a collection of design ideas in the form of a photo gallery which is included in the category of the Home Design Interior Modern . 12 | Floor to ceiling linens drape the stone wall where it meets the glass and stone floors, softening the look. 15 | Getting away doesn’t mean you can’t enjoy a good movie. This home theatre is fully equipped and uses simple grey upholstery in straight lines providing comfort without distracting from enjoyment of the film. 10 | The dining area, or tea room, defined by the natural fiber rug gives seating for dinner, tea, and has a spaced carved out for a desk chair when the space is being used for work. 13 | The lines follow throughout the house, even in the horizontal steps that synchronize with the lines of the tile floor and stone wall. 8 | The wall of glass between the living area and courtyard is not about keeping anything out, but bringing the elements in. The pavestones here share the same pattern as the window. 18 | The focus here is the natural stone rock that sits just outside of the window, providing a view and privacy. 23 | The bathing area seems to be incased in glass offering natural light for the entire area. This area offers a mix of materials from glass to brick, stone, and wood. 6 | The décor throughout the home is simple. The pair of fruit and sprig of leaves in the vase is all this space needed and brings more of the garden inside. This design is all about peace. A Tranquil Getaway Home In China you can make references to add insight into design, lots of design ideas which you can see in the gallery below. 4 | The sitting area flanked by two armless sofas and an armless chair practices restraint and invites you in to sit down with a good book, or simply gaze into the courtyard. 2 | The rectangular rug over stone tile declares the space decorated with understated furnishings in muted colored textiles. 27 | The entire first floor of the home houses the home theatre, living, and dining rooms. The second level is where you’ll find the bedrooms and bar area. 11 | The home looks like a part of the scenery instead of an interruption in nature. 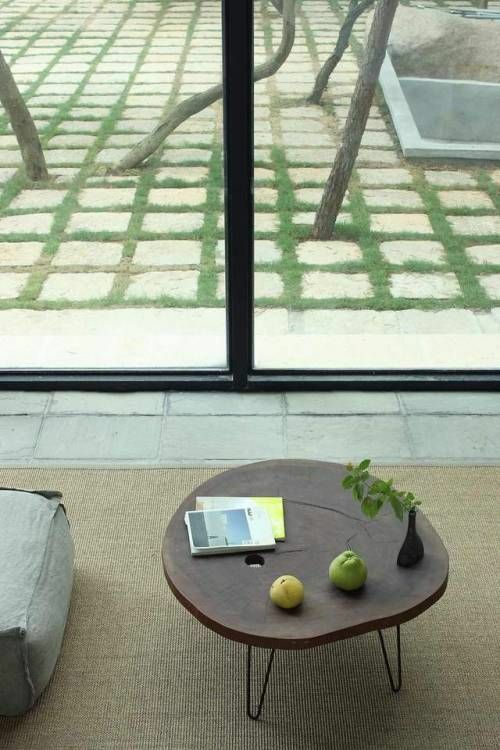 Simple, sparse trees adorn the courtyard and this is carried into the home with the uncluttered living area. 7 | The floor to ceiling windows offer ample lighting during the day, canned lighting is used by night. 17 | The designer created a peaceful retreat with subdued lighting and linens, natural wood headboard which also functions as storage on the reverse, and functional night tables. Striped drapes provide shading and a nice tempering effect. 28 | This shows the future plans of the home. There is more to come for this returning hut. 24 | The natural stone sits beside the steps down to the bath. The shower is just off to the side.